Exotics refer to any species of wild trout that establishes a self-sustaining population in geographic regions where they are not native. The most common exotic species in the US are Brown, Rainbow, and Brook Trout. Outside of their native range, they would have been established by stocking. 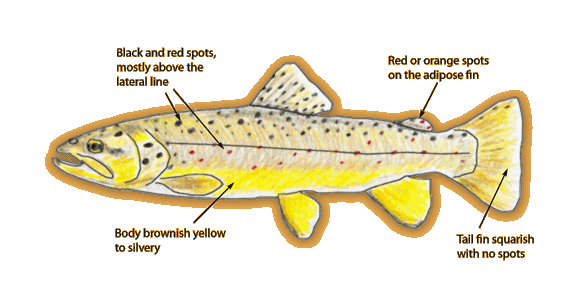 Brown Trout (illustrated) are exotic everywhere they reproduce in the United States (being native to northern Europe). Today, Rainbow Trout are found in virtually every state in the US that supports wild trout. However, in most of those places they are exotic, except for a narrow band along the Pacific coast. Similarly, Brook Trout are native to the East and parts of the mid-west (in the Great Lakes drainage), but exotic in many other places where they thrive today (e.g. the Rockies and Pacific Northwest). Most states in the US that support any wild trout, sustain at least one species of Native trout, even though exotics are dominant in essentially every state. In a few states, such as Arkansas and MO, which originally never supported native trout, exotics now survive in tailwaters.